Growing up on the mid-north coast of NSW, Sean O’Toole studied Communications at CSU in Bathurst before becoming a journalist at the local newspaper in Port Stephens. It was while working at the paper that Sean’s interest in local Aboriginal people was first kindled, and he published a range of stories highlighting the Aboriginal culture of the area. Following a stint in the Australian Federal Police, studied first a Master of Arts and then a Master of Education before being appointed Director Learning and Development for NSW Family & Community Services, the social welfare arm of the NSW government. 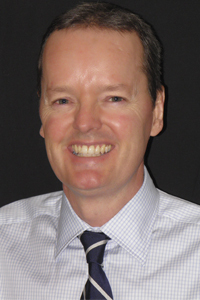 Over the past decade Sean has published five books, studied at Harvard University, won a Churchill Fellowship and become an accredited executive coach. He has also been part of a process of developing the capabilities and building the career paths of Aboriginal staff in the human services sector in NSW. Through this work, Sean received the 2015 Fulbright Professional Scholarship in Vocational Education and Training. Later this year he and will explore best practices in learning approaches and career development programs delivered in the United States. Here Sean shares more of his story. I wasn’t the first in my family to attend university... but I have always been aware of and grateful for the support of my parents and family in everything I have done. At school I... should have worked harder and not taken things for granted. My childhood was... quite adventurous. I don’t think I missed out on anything I really wanted to do. As a child, I was most curious about... pretty much everything. Pop culture related trivia always got me. I chose CSU because… I had family living in Bathurst and the course was highly recommended. My best experience at CSU... living on campus. My worst experience at CSU... nothing really. A bit like school I wish I had engaged more and worked a little harder. At university I was inspired… by film classes with Neil McDonald and John Baxter and a theatre class with Jerry Boland. Today I’m motivated… by my wife and kids and the desire to help others who haven’t had the luck and privilege I have had. In my profession it is important to… not make judgements on face value. I never dreamed I would… have such a connection with Indigenous culture. The more I learn the more I want to know. I’m most proud of… my wife and kids. In the future I’d like to… see the people I work with achieve great things. Helping others achieve their goals is a rare privilege and when I return to Australia from the Fulbright scholarship I plan to establish a specialist consulting business aimed at building personal and organisational capability for Aboriginal people. The best piece of advice I ever received... smart people surround themselves with smart people. The single-most important issue in the world is… family. The thing I wish I had done but never got around to... parachuting. One last thing... find whatever it is you do well and do it for a living.